This album shows the real Toronto metal scene is sparkling with some great new bands. The trio Skullfist, releasing their first five track EP album, has made a debut that is good, but not great. The first song “Sign Of The Warrior” is the best song here. It is the highlight in my opinion. Blazing fast, high energy rocker, catchy as hell chorus. One of the best driving songs I have heard in a long time. 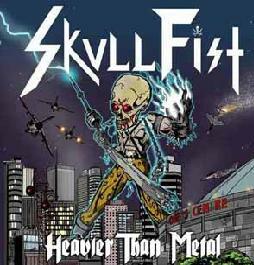 “Heavier than metal” the title track is the second song on this album. It’s not exactly fast or energetic but it is incredibly catchy. The pre-chorus verse riff slays, but the vocals are a little to clean for my taste. It’s a little light and fluffy, but man it’s so damn catchy that you don’t even notice how 80’s sounding it is. “Ride The Beast” has a straight up power metal feel to it, starting with an acoustic guitar intro and developing into a NWOBHM sounding tune that at times has fast moments after the first two minutes of the track. The music is wild and raw, the chorus is catchy, and the song is just full of attitude. There’s a breakdown at 2:51 that is damn near close to a Scorpions riffs, reminiscent to some riffs off the Lovedrive album. The material is in a straight-ahead NWOBHM-inspred direction. Altogether, I find the album’s songwriting is to be solid, the musicianship to be tight, and the sound quality to be worthy. “Blackout” is also not a bad song at all, though it doesn’t do anything to really stand out. Closer “No false metal” has quite melodic riffs and very power metal type vocals. This track is one of the album’s high points. Very fast and melodic at the same time. Nice guitar textures throughout – I really don’t have anything terrible to say about this album. A bit of polishing here and some fine tuning there and this band will be on there way. Since it’s only a 5 song EP you can rest assured that there’s no filler here. Great art work for a first release effort too.